The Bobwhite Quail, Northern Bobwhite, or Virginia Quail, Colinus virginianus, is a ground-dwelling bird native to North America. The name derives from their characteristic call. 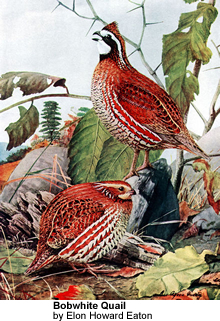 The Bobwhite Quail is a member of the group of species known as New World quail. It is a popular gamebird, particularly in the US Southern States, forming what are known as "coveys", groups of five to 30 birds, during the non-breeding season (roughly October-April). Quail primarily inhabit areas of early successional growth dominated by various species of pine, hardwood, woody, and herbaceous growth. However, quail habitat varies greatly throughout their range which extends from Mexico east to Florida and north into the Upper Midwest and Northeast. Bobwhites are distinguished by a black cap and black stripe behind the eye along the head. The area in between is white on males and yellow-brown on females. The body is brown, speckled in places with black or white on both sexes, and average weight is five to six ounces (145-200 grams). 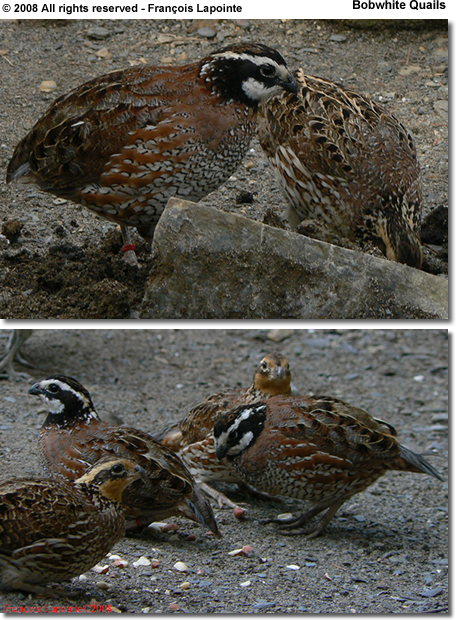 During the breeding season, typically beginning in mid-April, bobwhite coveys dissolve. Social pairs are typically formed between individuals of unknown relationship. These social pairings potentially result in the formation of a mate bond and subsequent female fertilization and egg formation. Eggs are laid at a rate of approximately 1 per day, and they hatch after 23 days. Eggs are normally white in color with a more pointed end than normal chicken eggs. Both males and females can incubate nests, with most nests predominantly incubated by females. If the first clutch of eggs is unsuccessful, a breeding pair (may be the same pair or a different pair as that which led to the previous nesting attempt) will attempt to lay, incubate, and hatch additional clutches. If the clutch is successful, chicks are precocial and will leave the nest approximately 24 hours following hatching. The breeding season continues until mid-October, and successful nesters (females) can potentially lay, incubate, and hatch up to 3 clutches. Bobwhites were previously classed with the Old World quails in the pheasant family Phasianidae, but are not particularly closely related. They and the other New World quails are now given their own family, Odontophoridae. The bobwhite's song is a rising, clear whistle, bob-Wight! or bob-bob-White! The call is most often given by males in spring and summertime. This quail is an economically important game bird that is propagated in large numbers for release on hunting preserves or natural areas as required by government wildlife agencies. It is also found in many aviaries and is on display in some zoos.